"Due to the rapid development of the Glenburn Housing estate in the early fifties an urgent need for a church to serve the Catholic community became of paramount importance. 28th June 1954 and subsequently became known as St. Peter&apos;s.
Fr. James Nevin was the first Parish Priest to be appointed. A semi-public oratory was established in the dining room with an adjoining room used as an overspill. The first Mass was celebrated in the House on 29th June 1954 - the feast of St. Peter and St. Paul. At the first Mass, ninety adults and one hundred and seventy five children were present. On 31st July 1954, Fr. Neil McGrory was appointed as an assistant Priest. At this time, work had begun on the building of St. Peter&apos;s Primary School which was opened in the Autumn of 1956 with Mr. Hugh Watson as its first Headmaster. After the school was opened, three of the four Sunday Masses were celebrated there. In November 1957, Fr. Joseph Quinn was appointed to the Parish - a very welcome help in the fast-growing Parish. St. Peter&apos;s. Fr. Nevin paid tribute to all who had worked so hard and had given their time and effort to achieve their goal - the longed-for Church. No sooner was the Church completed than ground was acquired on the other side of the House for a hall. Fr. Nevin was soon involved in the building of the hall that was to become the social centre in Glenburn. Sadly, not many years later - on Good Shepherd Sunday, 16th April 1961 - Fr. Nevin (RIP) died whilst officiating at the Mass which was being broadcast by the B.B.C. Fr. James Watters, Parish Priest of St. Joseph&apos;s (Clarkston) was transferred to St. Peter&apos;s and took up his appointment on 21st July 1961." St. Peter’s Parish has always been fortunate to benefit from the loyal support, generosity of spirit and deep-seated commitment of so many parishioners who, in their efforts to foster a strong Catholic community, have consistently given witness to their faith in so many ways. we take great comfort in knowing that - at every Mass - the whole community remembers all our deceased parishioners and we take solace from our belief that our loved ones now share in God’s promise of eternal peace. and our benefactors - can choose to dedicate individual or family Memorial Plaques to be engraved and permanently mounted on the walls around our Altar of Remembrance. Over the decades, although much has changed in society, the dedication and commitment of our Clergy and Parishioners has remained steadfast and this enables St. Peter’s Parish to continue to be a vibrant community today. Over the past ten years there have been many changes in St. Peter’s. No-one can deny that for many years the congregation “suffered” the discomfort of a very cold church. Thankfully, a new heating system was installed to replace the antiquated direct blower gas system which was so ineffective. This came at a cost of £40,000 but, with a concerted effort by the congregation, the cost was paid off in only three years – a momentous achievement! To further insulate the church, new double glazing was installed in the large windows of the building. New toilet facilities were installed at the back of the church thereby ensuring members of the congregation could access them without having to walk through the sacristy or indeed access them via the hall. An on-going maintenance programme including renovation and redecoration of the whole church has been systematically undertaken: We have a new Sanctuary carpet; new lighting has been installed; the Sacristy, Meeting Room and Altar Servers’ Room have been refurbished; there are new, matching doors to the Sacristy and former Baptistry (now sealed-off). As an aid to further security, CCTV has been installed (kindly donated by one parishioner) and has proved very effective to date. Recent additions also include an Altar of Remembrance, around which dedicated Memorial Plaques have been wall-mounted. On the Altar itself, a Parish Memorial Book will be permanently on display. This initiative has been very well received by our parishioners and benefactors. To our parishioners and benefactors, past and present, we owe a tremendous debt of gratitude for the immense support received. Thank you to all! Our church is often described by visitors as a warm, welcoming, place of beauty. Parishioners are justifiably proud of their church: we value the sacred space - and the prayerful environment created within - which always enhance the celebration of the liturgy. a spirit of openness and determination; and I encourage you to pray daily for the success of this new venture." all the needs of a parish community, Canon Eddie actively and whole-heartedly encourages and supports the Parish Pastoral Council as we engage in a wide range of activities and initiatives aimed at developing and strengthening the sense of identity and faith community that exists in the Parish. Youth Ministry – VIDES weekly club; Children’s Liturgy; Beavers/Cubs/Scouts. 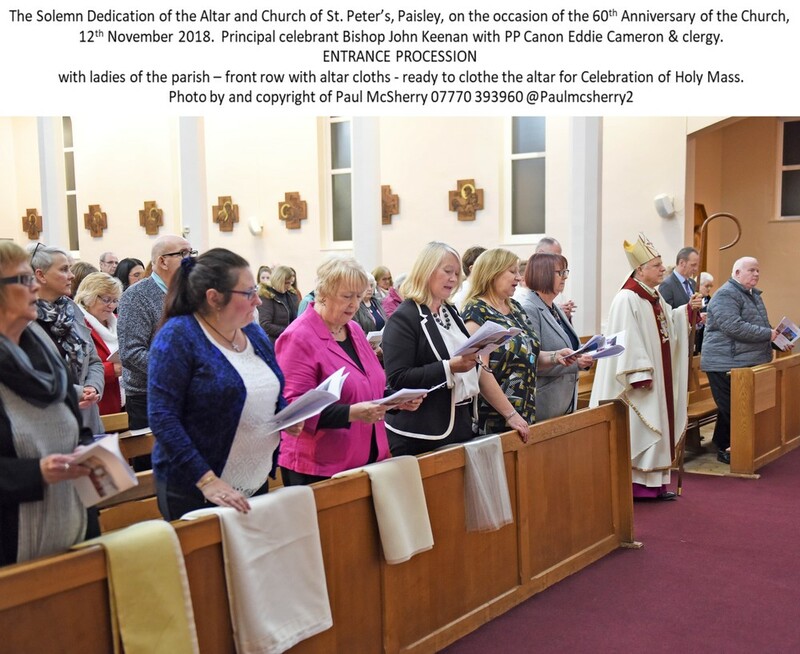 We have “Walked-in-Faith” and held joint liturgical services and social events with St. Paul’s Parishioners in celebration of our shared Patron Saints’ Feast Day – 29th June. Weekday Mass in St. Peter’s Parish, is celebrated in the Oratory which is located within the Parish House. The morning “Tea Club” - held in the Parish House after weekday Masses - is a notable hub of social activity - and is very much appreciated by all who attend. Parishioners and visitors alike are always assured of a very warm welcome. The Parish Council members recognise and are very appreciative of the level of support offered by Canon Eddie and Deacon John. In this Diamond Jubilee year for St. Peter’s Parish, we wish to take this opportunity to formally thank them both for their endeavours and we look forward to continuing to work closely with them both in the years ahead. As a fitting legacy to mark our Diamond Jubilee, our Parish has embraced the launching of an on-going ‘Lourdes Fund’ to provide the opportunity every two years for a suitable candidate in the Parish who is sick to travel with a carer/supporter to Lourdes on the Diocesan Pilgrimage. In the coming months it is hoped that a number of events will be organised to boost funds for this very worthy cause.